Newcastle United’s Fabian Schar suffered concussion against Georgia on Saturday, but was permitted to continue in the game. Schar receiving treatment after the collision. The Newcastle United man was knocked unconscious as he clashed heads with Jemal Tabidze early in Saturday’s Euro 2020 qualifier against Georgia in Tbilisi. Schar had a key role in both goals in a 2-0 win, but Headway is furious that an “incredibly dangerous” risk was taken with the player’s wellbeing. Charity chief Peter McCabe said: “What is it going to take to make football take concussion seriously? How many more players will have their careers and, more importantly, their lives and long-term health put at risk by the sport’s inability to follow its own protocols? Upon seeing footage of the incident, Schar told Blick after the match: “It looks awful. I can’t remember anything. I was out for a few seconds. Following the incident, Schar has been withdrawn from the Switzerland squad as they prepare to host Denmark in the Republic of Ireland’s Group D on Tuesday. Email “'My skull is still humming' - Calls for Uefa action after Swiss defender plays on despite bad head injury”. 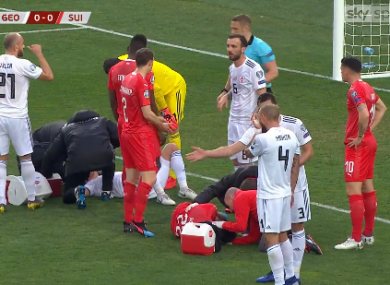 Feedback on “'My skull is still humming' - Calls for Uefa action after Swiss defender plays on despite bad head injury”.